The Hotronix® Fusion™ heat press combines draw and swing actions along with touch screen technology - decorating garments has never been easier. Using the touch screen you can program the Fusion™ to individually name and store customised print settings for most commonly used materials and transfers. 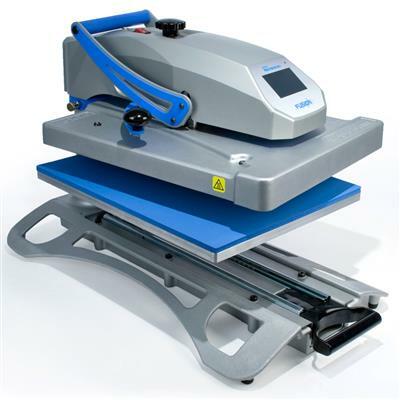 The Hotronix® Fusion™ heat press combines draw and swing actions along with touch screen technology - decorating garments has never been easier. Using the touch screen you can program the Fusion™ to individually name and store customised print settings for most commonly used materials and transfers. The Hotronix® Fusion™ is designed for fast garment loading and unloading. It's exclusive patented design allows it to perform as a swing or drawer press depeninding on user preference and space. Interchangeable lower platens are available (optional extra's) and easy to change without special tools making the The Hotronix® Fusion™ truly versatile.